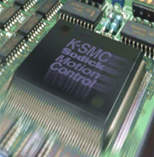 K-SMC, Sodick's motion controller; Created to drive a linear motor as quickly and accurately as possible. The role of a motion controller is to control the high-speed and high- precision motion of a linear motor in accordance with instructions from a CNC unit. All Sodick machines operate with Sodick Motion Control (K-SMC) technology, developed specifically for Sodick linear motor drives. The external features include maximum and logical ease of use. The internal K-SMC functions on the basis of a 64-bit multifunctional open system. The K-SMC directly monitors and automatically readjusts the spark gap - without any of the delays formerly experienced with the gap detector. The energy consumption is cut by approximately 40% and machining times are significantly reduced. 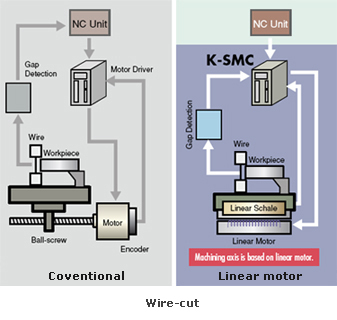 The K-SMC controls the axes movement and replaces the older style motor drivers. Sodick’s K-SMC motion controller maximises the speed and acceleration of the linear motor axes drives resulting in improved table positioning accuracy and reduced axes delays. Thanks to ideal dynamics Sodick linear drives correct the spark gap up to 500 times per second. This gives the optimum gap and optimum energy conditions at any point in the EDM process. Providing maximum metal removal, maximum achievable speed and surface quality for any given conditions. 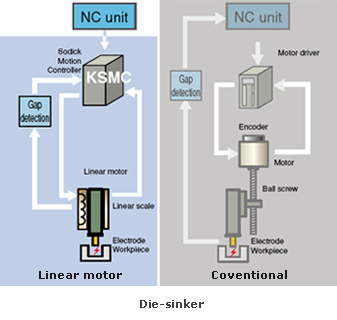 The K-SMC can move up to 8 axes simultaneously unlike conventional motor drivers that move only one axis at a time. When linear motors are combined with the K-SMC, they vastly reduce wire breaks whilst simultaneously increasing the EDM rate and maintaining the optimal discharge spark gap. Each linear drive is individual and the CNC is tuned into each of the drives. In fact in Sodick linear EDMs there are standard adjustment programs ("ripple_XYZ" and "tcomp") scanning the magnet characteristics of each drive. In fact the programs play the role of a built-in laser interferometer, allowing the user when necessary to tune the CNC to the linear drives in the most accurate way and to correct the setting at any time.